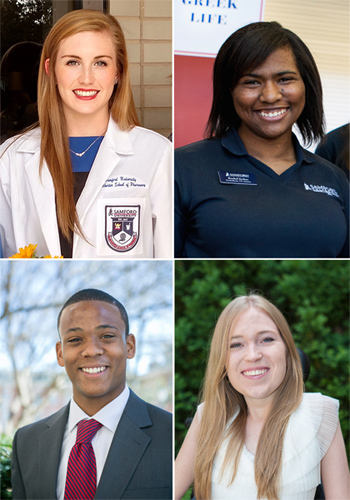 The Albert Schweitzer Fellowship (ASF) has named a current Samford University graduate student and three recent alumni to its inaugural class of Alabama Schweitzer Fellows. McWhorter School of Pharmacy student Caitlyn Cleghorn and Howard College of Arts and Sciences alumni Frances Isbell ’15, David Osula ’15 and Rachel Stokes '14 are among 16 graduate students in Alabama, and approximately 240 nationally, who will spend the next year learning to effectively address the social factors that impact health, and developing lifelong leadership skills. Schweitzer Fellows develop and implement service projects that address the root causes of health disparities in under-resourced communities, while also fulfilling their academic responsibilities. Each project is implemented in collaboration with a community-based health and/or social service organization. “The fellowship will help me sharpen my leadership and communication skills, and prepare me to think critically about how to solve problems unique to every individual’s circumstances,” Cleghorn said of the Schweitzer honor. “I’m very excited to see how the relationships I form within this organization enrich my professional experience in the years to come,” she added. Isbell is a Samford English and University Fellows alumna currently studying in the University of Alabama School of Law. At Samford, she earned the Gail Hyle Memorial Award and the Rufus W. Shelton Community Service Award in part for her advocacy of improved disability access on campus. She founded the DiversABILITY advocacy organization as an undergraduate. As a Schweitzer Fellow, she will open a chapter of NMD United in Alabama, create a support network for teens and adults with neuromuscular conditions such as Multiple Sclerosis and Spinal Muscular Atrophy, and organize pro bono legal clinics to help people with those disabilities access the resources they need to live independently. Osula, a Samford biochemistry major and University Fellows alumnus, is studying in the University of Alabama at Birmingham School of Medicine. At Samford, he served as student liaison for the Habitat for Humanity housing ministry. As a Schweitzer Fellow, he will continue that community service focus by developing the Academy of Health Sciences Mentoring Program at Carver High School for high school students who are interested in healthcare careers. Samford environmental science alumna Rachel Stokes is studying in the University of Alabama at Birmingham School of Public Health. As an undergraduate she was active in The Leading Edge Institute and many Samford student organizations, including the Student Government Association. For her Schweitzer project, she will address food insecurity in Birmingham by developing aquaponics and community gardens that will increase the availability of fresh produce year-round for partners and constituents of the Christian Service Mission organization. Schweitzer Fellows work at program sites around the United States, as well as one in Lambaréné, Gabon, at the site of the Albert Schweitzer Hospital founded by Dr. Schweitzer in 1913. Upon completion of their fellowship year, the 2016–17 honorees will become Schweitzer Fellows for Life and join a vibrant network of more than 3,200 Schweitzer alumni who are skilled in and committed to addressing the health needs of underserved people throughout their careers, said Boggs. Katie Stripling is executive director of external relations for the College of Health Sciences.